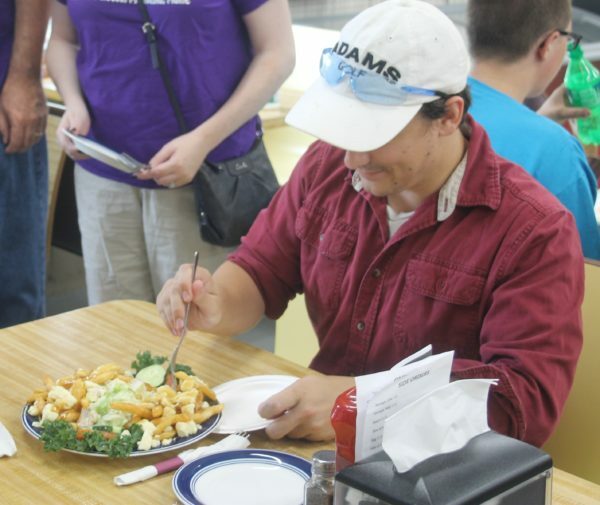 MADAWASKA, Maine — Directors with the St. John Valley Chamber of Commerce, along with a few members of the general public, participated in the quest to find the best poutine in the Valley on Friday. Texture, flavor, uniqueness, and overall taste were the four criteria the judges used to assess the entries in the Best Restaurant Poutine Contest, being held in conjunction with the Acadian Festival. 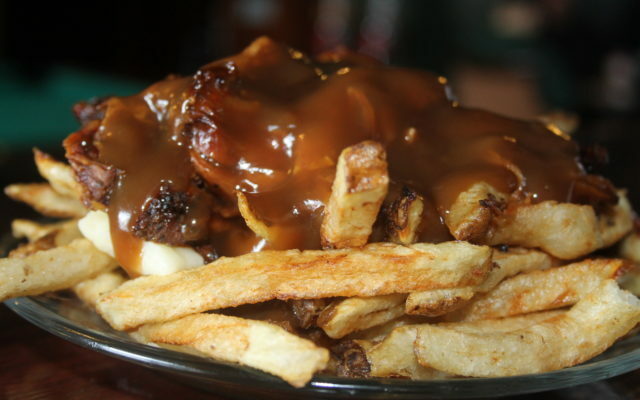 Several area restaurants participated in the competition as an homage to the traditional Quebecois delicacy of french-fried potatoes covered in gravy and cheese curds. Among the entries were offerings from Morin’s Variety, Orchids, Tastee Freeze, Big Rick’s Burgers and Wings, Roy’s Variety, and Long Lake Sporting Club. “We all have degrees in culinary — we watch cooking shows,” joked chamber director Brian Bouley, one of the judges. He was joined on the judging panel by chamber board members Brenda Forbes and Lois Muller, and by residents Cai Bouley and Seth Lagasse. Seth Lagasse, an active member of the community who serves on several boards in the Valley, said he was participating as a judge for one very important reason — “I’m training for the [poutine] eating contest. 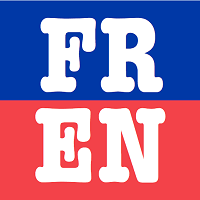 The tour of participating restaurants began at 9 a.m. Friday morning and lasted until 12:30 p.m.. At each location, the judges were wowed with the presentation and creativity of the seemingly simple poutine. Poutines like the Surf and Turf from Orchids, which featured filet mignon and lobster smothered in a bernaise sauce added a classy touch to the otherwise messy, greasy and tasty dish to which the Valley has grown accustomed. Then, Tastee Freeze showed up to the party with their long list of fried, hearty, poutines crafted to never leave anyone hungry. 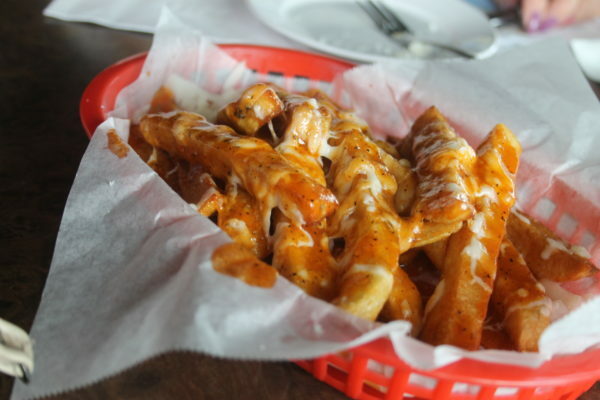 “It’s like a heart attack on a plate,” Cai Bouley said referring to the Cheese Stick Poutine from Tastee Freeze. But the most different of all had to be the S’Mores Poutine from Roy’s Variety. 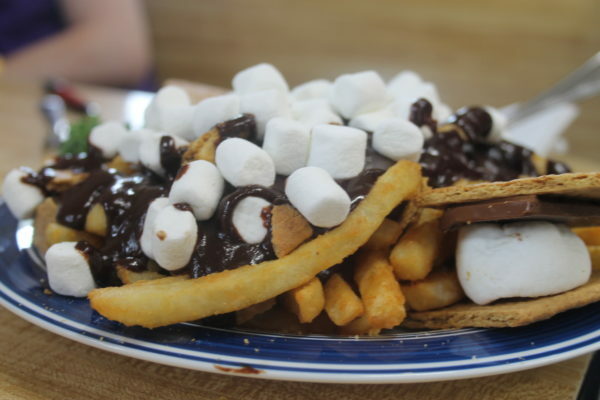 Melted chocolate and marshmallows covered this mountain of fries that seemed to appeal to the judges. Winners will be announced during the 3rd Annual Poutine Palooza at Big Rick’s Burgers and Wings on Friday at 7:30 after the poutine eating contest.